There is a system for choosing the best tie knot style; simply put you should look to coordinate your necktie knot with your shirt collar’s shape. 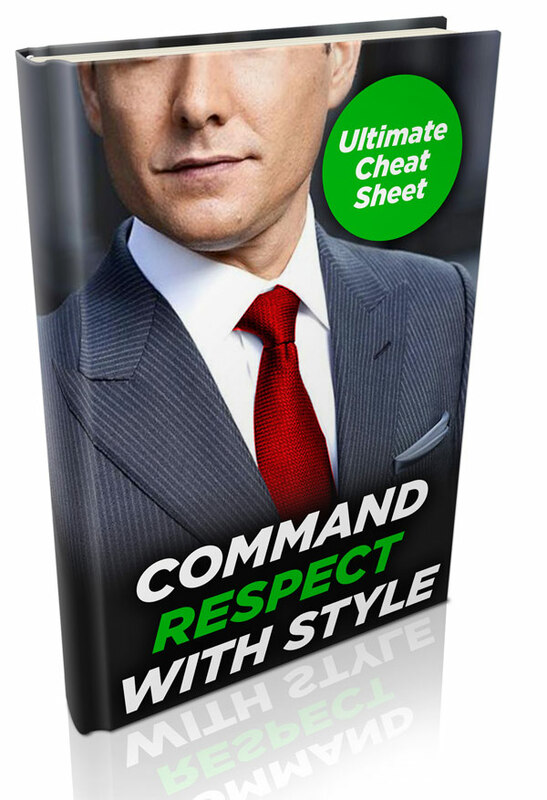 Most men know how to tie a necktie one way; out of convenience, laziness, and blissful ignorance they match that one known knot with every shirt collar type they encounter. Although not a crime, the mismatching of a tie knot with the collar style should be avoided for two reasons. 1. It fails to capture the natural harmony between the right tie knot’s lines and the shape of the shirt collar. As any designer can expand upon, there are natural lines and proportions that appear to us as in harmony when matched – violating these rules we trigger a subconscious feeling of something being askew. Not a feeling you want to evoke when the necktie knot is so close to your face. 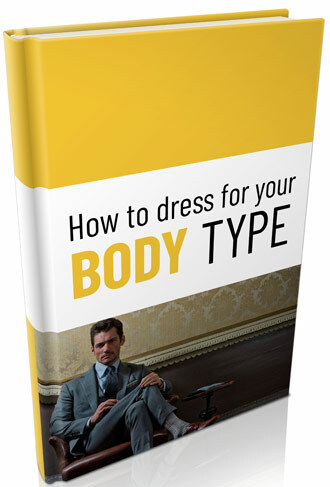 This makes you look like a clown instead of a gentleman. Example – a tight four in hand knot tied using a thin & lightweight tie mixed with a wide spread collar will over extenuate the collar’s extreme points making them look like a 1970’s flashback. This is not the message a well dressed gentleman wants to send. What tie knot is best for you? There are four things you should weigh when deciding which necktie knot to tie: 1) the shirt collar type, 2) your body type 3) necktie design and 4) tie construction. How the dress shirt collar type affects what tie knot you should choose – As a general rule you want to match the knot to the shirt collar type, meaning that different shirt collars have varying notch sizes and point angles that create a range tie knot gap sizes. A wide spread collar, whose points extend out an angle greater than 90 degrees, requires a larger and more triangular shaped necktie knot while a straight point collar, whose points extend out an angle less than 60 degrees, calls for a narrow and longer shaped tie knot. Men with a larger neck size should wear a tie knot that fits proportionally. On the other hand tall and skinny men are better off wearing a slightly smaller and longish shaped knot. Finally there is the necktie itself. Thicker Italian silk ties look better with a triangular shaped tie knot, such as the Double Windsor, while more traditional patterned ties, such as British striped ties, look best with a Four in Hand knot. The Four in Hand knot is one of the oldest tie knots that originated in England towards the end of the 19th century. It is said that British horsemen invented this type of knot when they were tying their scarves with one hand while holding the reigns of four horses in the other – hence the name “Four in Hand”. The Four in Hand knot is one of the easiest tie knots to learn. The knot has a smaller, slightly longish shape that is perfect for narrow spread collars as well as for button down collar dress shirts. The classic look of this knot is perfect for British striped, and Regimental ties. Since the Four in Hand requires less of the tie’s length, it is also a great choice knot for tall men trying to tie a regular length tie to the right length – so that the tip of the tie ends near the center of the belt buckle. 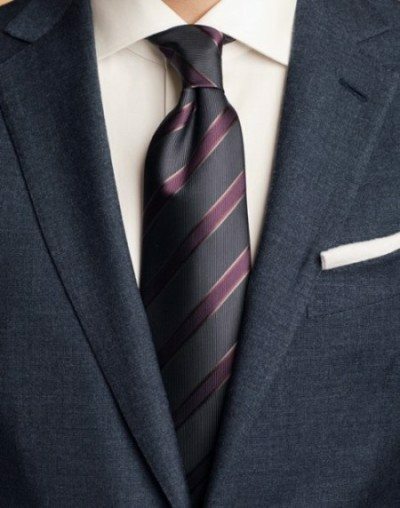 The half Windsor knot is the smaller version of the Windsor -sometimes also called double Windsor knot. 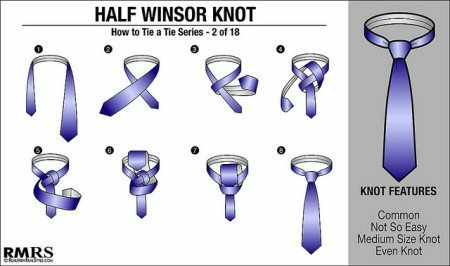 The half Windsor has a more triangular shape than the Four in Hand knot. It is a perfect choice knot for medium-width spread collars and thick designer ties. Because the half Windsor requires less of the tie’s length than the larger Windsor knot, it is also a great choice for big & tall men trying to wear a regular length tie. Of the four main knots, the half Windsor is the most versatile yet underutilized knot. You would do well to learn to tie this tie knot. 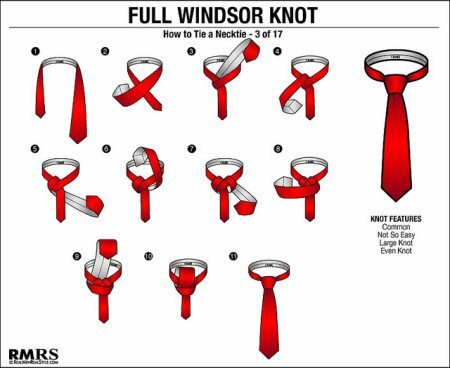 The Windsor knot is sometimes also called “Full Windsor” or “Double Windsor”. 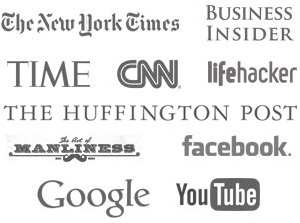 It is the most searched necktie knot on the Internet today, and any regular tie wearer should know it. 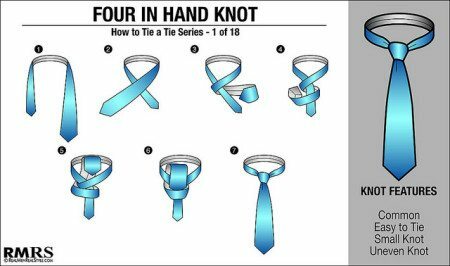 However, out of all the tie knots described it is the one that will require the most practice and for most men is the knot they should use only on occasion (unless you only own wide spread collars!). The Windsor knot has a larger triangular symmetric shape. It is the perfect knot for wide spread collars, for modern striped and foulard patterned ties, as well as for men with a large neck. Because the Windsor knot requires two wrappings, additional tie length is needed. Therefore, tall men and men with a larger neck size will need a longer length tie. Extra long ties that typically measure 61 – 64 inches in length are needed here. Necktie aficionados go to great length to create the perfect necktie knot; the “cherry on top” of the perfect tie knot is the “dimple”. The dimple is a purposely created crease on top of the knot. It adds a more textured look to the tie and gives the necktie a perfect drape. The dimple is created in the final steps when tying a tie. To make a dimpled tie knot, carefully fold a crease at the center of the tie. 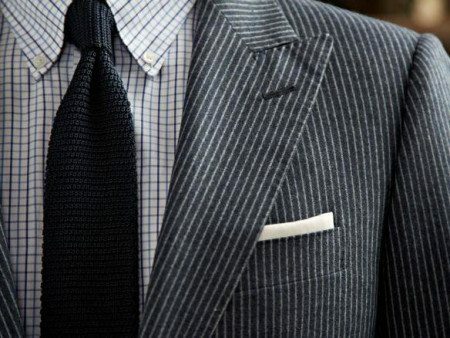 Make sure that the crease goes all the way through, and even onto the back of the tie knot. Then, carefully tighten the tie knot while holding the crease in place. Creating a dimpled necktie knot takes a little bit of practice, but once mastered, adds the ultimate touch of sophistication to any men’s suit & tie ensemble.